Glipizide is a Generic name for an oral fast and short acting anti-diabetic drug that belong to the second generation sulfonylurea class. The second generation means that this drug undergoes enterohepatic circulation, this generation drugs are more potent and have shorter half-lives than the sulfonylureas first-generation drugs such as: acetohexamide, carbutamide, tolbutamide and chlorpropamide. Glipizide helps control blood sugar levels in blood by helping pancreas to produce insulin and helping the body use insulin efficiently. Glipizide is used together with exercise and diet and sometimes in combination with other drugs, to treat type 2 diabetes. This drug will lower blood sugar levels in blood only in patients whose bodies produce insulin naturally, that’s why Glipizide is not used for the treatment of diabetes type 1or diabetic ketoacidosis. Popular Brand names on the market for products containing Glipizide as an active ingredient are: GlipiZIDE XL, Glucotrol and Glucotrol XL. How does Glipizide work in the body? 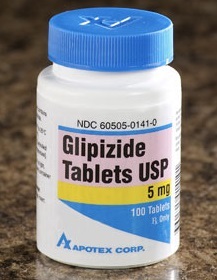 Glipizide’s primary mode of action, in which this drug lower sugar levels in blood, is stimulation of insulin secretion from the beta cells of pancreas, an effect which is dependent upon beta cells function in the pancreatic islets. Glipizde binds to ATP-sensitive potassium-channel receptors located on the pancreatic cells membrane, reducing conductance of potassium and causing membrane depolarization. Depolarization then stimulates influx of calcium ions through voltage-sensitive calcium channels, raising concentrations of calcium ions in cells, which then prompts the secretion of insulin. Stimulation of insulin secretion in response to a meal is major importance for our body. Fasting insulin levels are not raised even on long-term use of glipizide but the postprandial insulin response remains to be enhanced after at least 6 months of glipizide therapy. However, some patients fail to initially response, or during time gradually lose their responsiveness to sulfonylurea drugs and glipizide generally. Can patients take Metformin and Glipizide together? Glipizide and Metformin combination is indicated for the treatment of high blood sugar levels that are caused by diabetes mellitus type 2. Combination of these two drugs can help body to regulate high blood sugar levels on efficient way. Glipizide stimulates insulin release from the pancreas, directing the body to store blood sugar and thus reducing the sugar levels in blood. Metformin has three different mode of actions: it lowers intestines absorption of sugar, stops liver from converting stored sugar (glycogen) into blood sugar; and it helps body to use insulin more efficiently. There are also products on the market containing the combination of metformin and glipizide in one tablet, such as Metaglip, containing 2.5 mg of glipizide and 500mg of metformin in one dosage form. However, under certain conditions and in some predisposed patients, too much metformin and glipizide can cause lactic acidosis a serious condition. Lactic acidosis symptoms are usually quick and severe to appear and usually occur when other health problems not related to the medicine are present and are very severe, such as a heart attack or kidney failure. So, doctor should follow the beginning of therapy especially during the first few weeks that you take this medicine. The table below shows the incidence of side effects after Metformin and Glipizide administration in recommendable doses. The incidence can be increased if these drugs are taken together or overdosed. Can Metformin be used together with alcohol? It is not recommended that alcohol can be consumed when patients are taking metformin. Alcohol may increase the risk of developing a serious, life-threatening condition known as lactic acidosis. However, many health professionals will say that small amounts of alcohol can be consumed without side effects. Patients should discuss the consumption of alcohol while they are on a metformin therapy. Large amounts of alcohol, such as binge drinking or every day drinking, increases the risk of lactic acidosis. In addition, alcohol reduces sugar levels in blood which increases the risk of hypoglycemia. Patients should look for medical attention if they experience: nausea and vomiting, weakness, extreme fatigue, stomach pain, dizziness, shortness of breath, lightheadedness, flushing of the skin or feeling cold, fast or slow heartbeat. Before taking Metformin, patients should tell their doctor or pharmacist if they are allergic to metformin; or if they have any other allergies. Products with metformin may contain inactive ingredients that can cause allergic reactions or other problems. Before using Metformin, patients should tell their doctor or pharmacist their medical history, especially if they ever had or have: breathing problems such as obstructive lung disease and asthma, blood problems such as anemia or vitamin B12 deficiency, kidney or liver disease. Patients using Metformin should tell their doctors that they are using metformin before having surgery or any X-ray scanning procedure that use injectable iodinated contrast material. Patients on a Metformin therapy may experience blurred vision, drowsiness or dizziness, or due to extremely low or high blood sugar levels. They should not drive, use machinery, or do any activity that requires alertness or clear vision until they are sure that they can perform such activities safely. Patients using Metformin should limit the usage of alcohol while using this medication because alcohol can increase the risk of lactic acidosis and low blood sugar can be developed. Geriatric patients on Metformin therapy may be at higher risk for side effects such as low blood sugar or lactic acidosis. Pregnant patients should use Metformin only when it is clearly needed. Patients should discuss the risks and benefits with their doctor. Doctor may direct to use insulin instead of metformin during pregnancy. 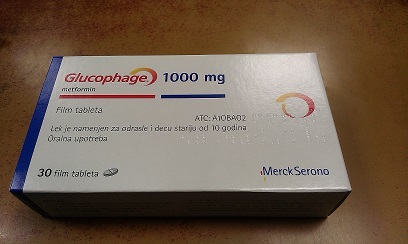 Before taking glipizide, patients should tell their doctor if they have liver or kidney disease, blockage of intestine chronic, diarrhea, deficiency of glucose-6-phosphate dehydrogenase (G6PD), a disorder of adrenal or pituitary glands, or a history of heart disease, or if they are malnourished. Patients should now, that Glipizide therapy is only part of a complete antidiabetic program that may also include diet, weight control, exercise, and testing blood sugar. Patients should follow their therapy, diet, and exercise routines carefully. Changing any of these factors can affect your blood sugar levels. Alcohol may make the side effects of glipizide worse. Consuming alcohol together with glipizide may rarely cause symptoms such as: flushing (reddening of the face), vomiting, chest pain, weakness, headache, nausea, blurred vision, sweating, choking, mental confusion, breathing difficulty, and anxiety. Glipizide may make skin sensitive to sunlight. Glipizide and all sulfonylureas drugs are associated with weight gain, but less so than insulin. Sulfonylureas may cause hypoglycemia and require consistent food intake to decrease this risk. The risk of hypoglycemia is increased in elderly, debilitated and malnourished individuals.